In order to have a large pen capacity and get some organization, I actually have two pencil cases instead of one. 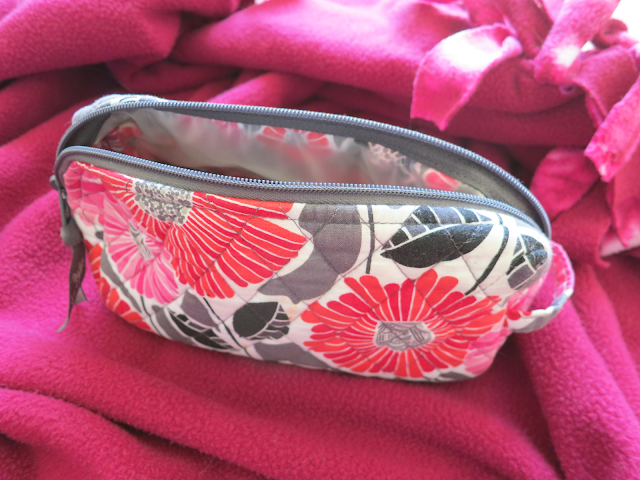 The first one is a Vera Bradley cosmetic bag in the cherry blossom print. 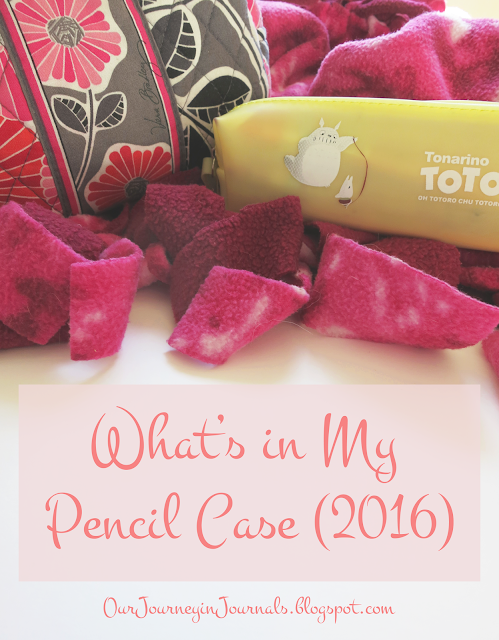 In here, I keep basic stationery - like pencils and sticky notes - and other random items. The inside of the "case" has waterproof lining, so cleaning it out is very easy. These are the pens/markers that I keep in the first pencil case. 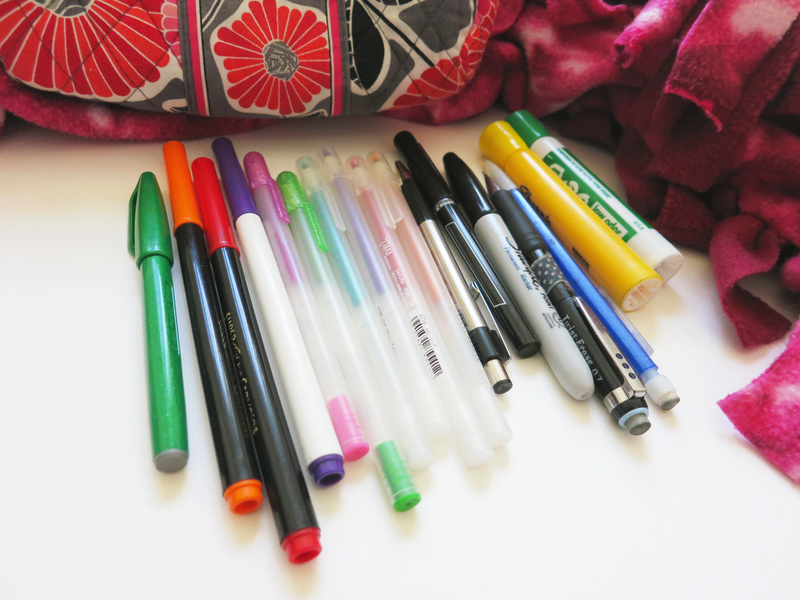 I have a couple of Crayola Super Tip markers and various Sakura Gelly Roll gel pens that I use for bullet journaling and note-taking, random pencils, a Zebra F-G01 ballpoint pen, a Pilot Precise V5 gel pen (for black pen emergencies), various brush pen(s) (currently a green Pental Sign Fude Touch brush pen in green that goes with my September bujo theme), an Expo dry erase marker, and a random Sharpie highlighter and permanent marker. The rest of the stuff in this first pen case is pretty generic. 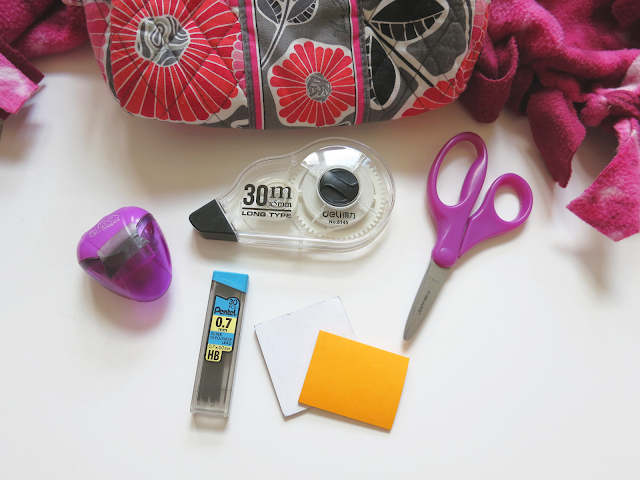 The pencil sharpener, the mechanical pencil graphite refills in 0.7 mm, the Post It notes (which I mostly use to stick reminders onto my laptop), and the small Fiskars scissors are all from Meijers, where I do a lot of my general school supply shopping. The only notable item is that giant thing of correction tape that I got from China. It has 30 m of tape, and I have a couple of more of these stashed in my room, so I'm not going to be running out of correction tape for a long, long time. This Vera Bradley pouch doesn't have any sort of organization in it at all, as it just has one big pocket, but I don't really care; it can be inconvenient at times, but it doesn't matter that much. 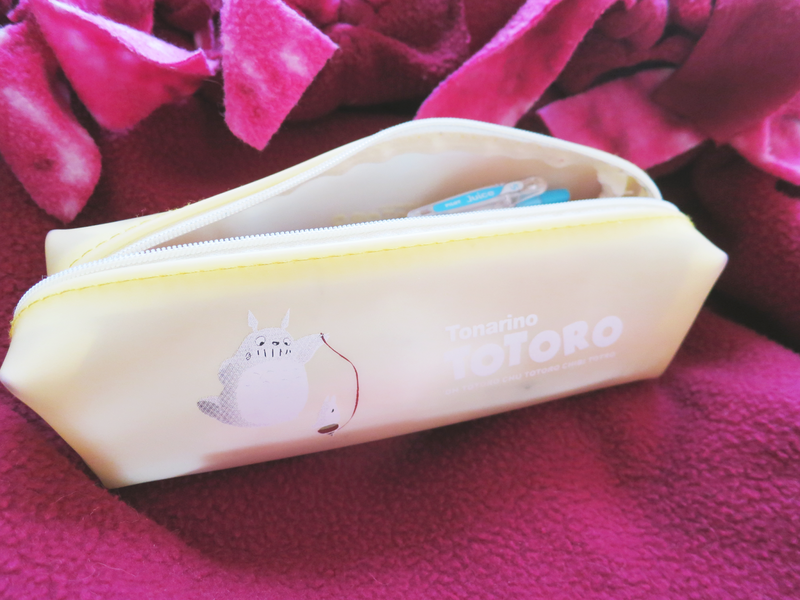 If you don't want to buy a fancy pencil case but still want something that can hold a sizable amount of things, then I suggest just using a cosmetic bag; there are a lot of affordable and pretty ones out there, and the inner lining that most have makes for convenient clean-out. Case 2: Colored Pens, etc. The second pencil case I use is a smaller pouch that actually is meant to be used as a pencil case. I'm not sure where my family got it, but I know you can find it pretty cheaply on Aliexpress. This case in particular just one day appeared in my house, and no one else claimed it. Thus, I decided to use it myself. It's made out of some sort of translucent, rubbery material, and it has held up pretty well during my time in China and school so far. It can actually fit a deceptively large amount of pens. 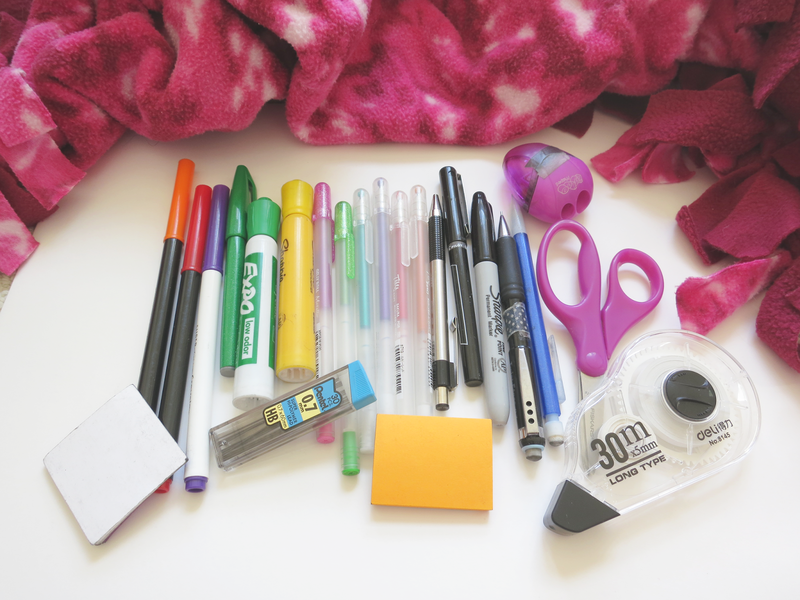 In here, I keep the majority of my colored gel pens and some highlighters that I use for rewritten notes, annotating, etc. There are also a couple of pens with rubber parts that are kept in here so that they can be protected from the incredibly ~evil~ pencil shavings, eraser dust, and other gunk that float around in the other case. 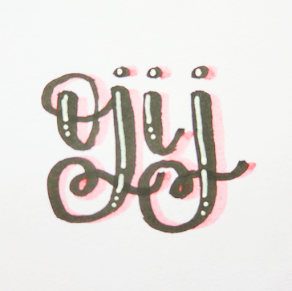 My current favorite gel pen is the Pilot Juice in 0.5 mm, which I wrote a review on, so almost all of the gel pens in here are Pilot Juices in 0.5 that I got while in China. I use each of these different colors for each of my individual classes and for different, specific things in my note-taking system. But yeah, I love them. They're seriously great. To read more info about them, just check this out. 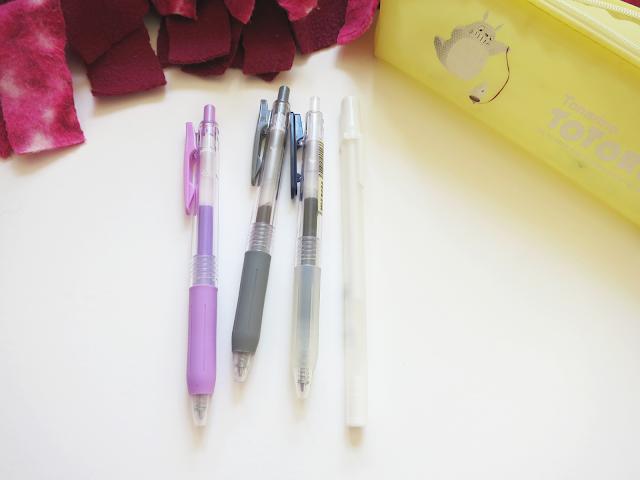 The only other gel pens that are black sheep in this pen case are a Zebra Sarasa Push Clip in 0.5 milk purple and 0.7 gray that I bought from Tokyo Pen Shop (but I guess it's more of a gray sheep ha ha ha . . .), a Muji Retractable Gel Pen in 0.5 blue-black, and a white Sakura Gelly Roll Classic that I also am using in my September monthly spread. I would prefer to keep the latter it in the first pencil case, but the fact that it has a white cap means that it gets dirty rather easily. 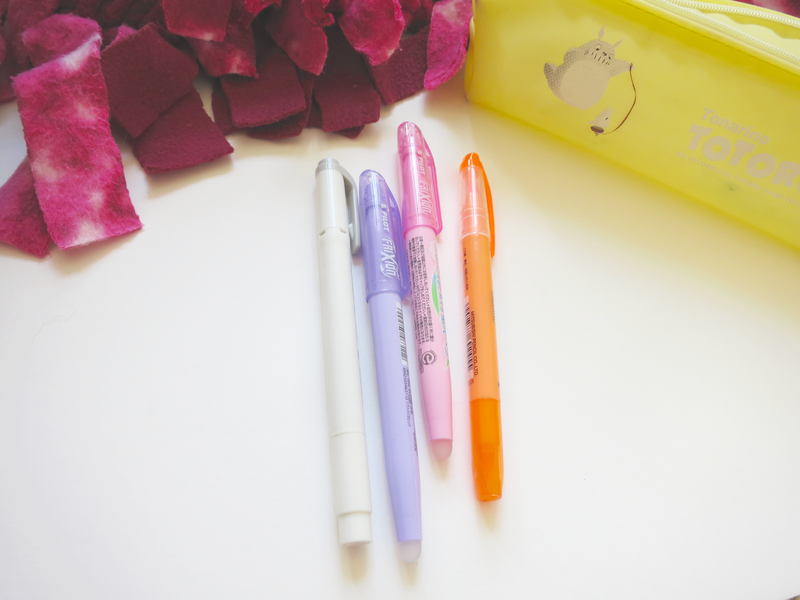 Along with a plethora of pens, I also store four highlighters in this second pencil pouch. I have two Pilot FriXion Light and Soft Highlighters in pink and purple, a gray Zebra Mildliner, and a fluorescent orange Uni Propus Window Highlighter. I own a lot more highlighters than this (lol many more than I actually need - the mark of a true stationery addict), but these are the ones that I actually use frequently in my note-taking. Now, you may be asking, "But where do you keep other junk like a calculator or a basic black pen that you don't hate*?" Or you might not be asking that. It doesn't really matter; I'm gonna tell you anyway. My backpack has four zippered areas/compartments/pockets, and one of them is perfect for storing pencils and crap like that. It's basically like my third pencil pouch. *I'm not a fan of the Pilot Precise V5. I just need to finish it. The highlights of this super convenient pocket include my trusty PaperMate Clearpoint mechanical pencil in 0.7 mm that almost everyone has, a black pen (usually a Pilot Juice but currently a Muji Retractable Gel Pen), both mechanical and traditional, my wonderful TI-30X IIS calculator, a protractor that doubles as a ruler, a random thing of lip balm (since my lips get dry really easily), and random pencils and ancient (i.e. 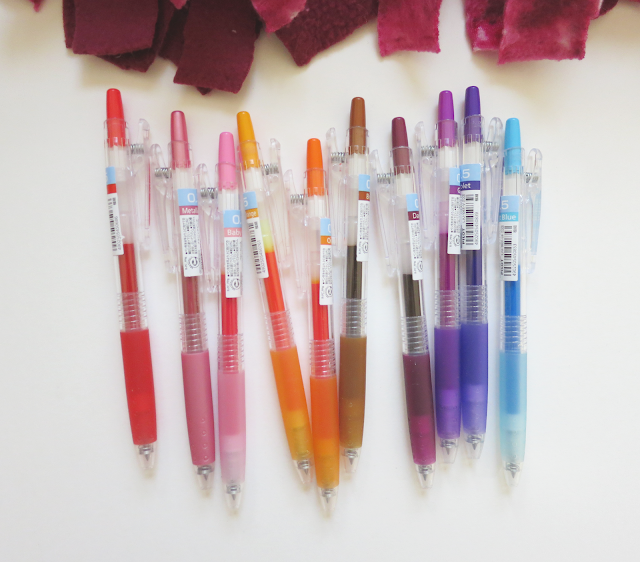 several years old) 0.7 Pilot G2s. The pencils and G2s are the writing utensils that I'm willing to lend to people, so that's why they're placed in this nice and accessible location. So that's everything that I keep in my pencil cases. I hope this was helpful for you or at least interesting to read! 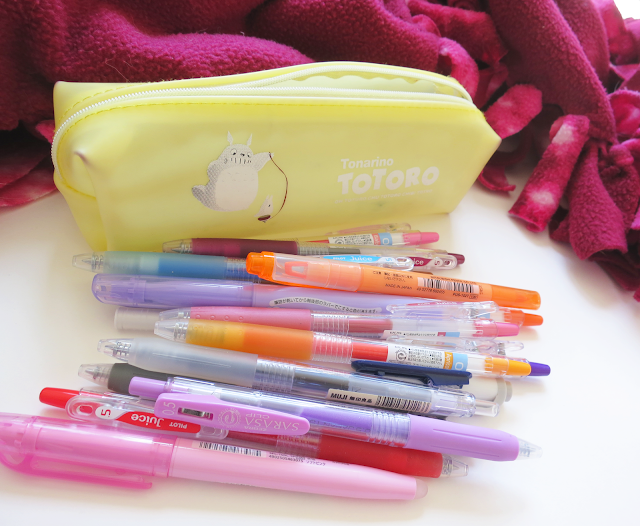 Comment down below an item (or items) that you wouldn't be able to live without in your pencil/pen case!